More than 90 pupils were put in isolation at a secondary school for wearing the wrong trousers. They were excluded from lessons at St Peter's Academy, Stoke-on-Trent, as the trousers did not have purple piping. Ninety-two children were in isolation on Monday and 37 on Tuesday, which left one parent "disgusted" that "trousers override education". The school said it was to raise standards and pupils could return to lessons if the uniform had been bought. Parents and pupils had been told in March, June and July that those who did not have on the correct new uniform including purple piping on trouser pockets would be excluded from lessons, it said. Lynn, whose son has attended the school for the past three years, told the BBC, she sent him to school without knowing about the changes. She was called by the school at about 15:00 BST on Monday informing her that her son had been kept in isolation all day. A second mother who wished to remain anonymous said they were "twice as expensive, but they do look smarter". She said she used to spend under £200 on the uniform which includes a blazer, shirt, tie, trousers of a skirt, and had now spent between £200 and £300, including shoes. 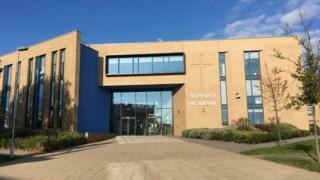 Head teacher Michael Astley said the uniform change was about raising standards and preparing students for life outside the school and financial help was available to parents it it was needed. If parents were waiting for new trousers to arrive, then students would be allowed back into lessons, but "if no attempt has been made to wear the correct uniform, then they will not be in lessons", he added.